IF YOU’D LIKE TO LISTEN TO OR DOWNLOAD THE PODCAST VERSION OF THIS POST, PLEASE SCROLL TO THE BOTTOM. ENJOY! I disagree strongly with a recent article about the purported “dangers” of Massive Open Online Courses, or MOOCs, on slate.com. The author’s generalizations about MOOCs, and the overall tone of the piece, are especially disappointing coming from a professor. Many of the Comments after the article are far more enlightened than the article itself. The author sounds like someone afraid of inevitable change, worried about his own job, and blind to the real benefit that MOOCs can represent–including to him. I’m not saying every MOOC is a winner. Heck, I’ve only taken one such course so far, and I’ve heard from colleagues that some are complete crap. But you know what? That happens at brick and mortar colleges, too. Even Ivy League ones. And there, it costs a lot more. I can only say that my first MOOC experience was excellent. The video lectures were engaging and interesting. I actively debated the wording on some quiz questions in the discussion forums, and received an answer from the professor himself. He disagreed with some of my points, but eventually agreed to regrade one of the questions based on the feedback. There were even a few “open house” video hours where the professor met with a handful of students from the class to discuss specific aspects of the main topic (which was Gamification, another oft-misunderstood topic in education). Best of all, the three homework assignments were genuinely thought-provoking, and I had a great time completing them. I’ve posted them individually on this blog, in fact, if you’d like to explore them. True, the peer grading system for the course I took was imperfect, but it worked well enough, and having graded my share of undergrad papers while in grad school, I found it all very manageable. Oh, and the course was free. The author of the slate.com article paints a nightmarish vision where MOOCs will put classroom professors out of work, or at least greatly diminish their pay, and also rob students of the richness of a real professor-student relationship, not to mention a good education. I earned my undergrad degree from Harvard. In the larger lecture courses, the well-known professor showed up at the podium and gave his canned lecture (in fact, one fellow was famous for reading from the same dog-eared index cards, jokes and all, that he had apparently used for over twenty years; and no, the jokes weren’t particularly funny). In some cases, if he was in a particularly giving vein, a professor might take a few questions before heading back to his House for lunch. That was it for professor-student contact for the big lectures. For those larger courses, the real learning happened in the subsequent House-based breakout sections with the teaching fellows and classmates, and the learning effectiveness rose or fell based on the quality of the section leader and the student’s own level of participation. The Coursera MOOC I took certainly qualified as a large lecture course. Initially, almost 10,000 students enrolled–although that number diminished significantly by the end of the course, once people realized there was a genuine workload involved. The professor delivered enthusiastic video lectures, but also dipped into the online discussion forums pretty regularly, and his teaching fellows answered the rest of the questions in a variety of active forum discussions. In other words, the teaching model and the student experience were not all that different from what I experienced on campus at Harvard. MOOCs might seem most threatening to a professor at a small college, perhaps, where there can be closer regular contact with professors. I certainly experienced that in some of the smaller courses I took at Harvard, and yes, it was more satisfying. But even there, I think such a professor at a small college complaining about MOOCS would be missing the point. I don’t think anyone expects or intends for MOOCs to replace brick and mortar education. Any brick and mortar institution out there telling itself it can downsize the teaching staff in any significant way in favor of MOOCs as a budgetary “magic bullet” is kidding itself. But I would also say that any Professor who dismisses MOOCs is also not facing reality. MOOCs are evolving as a result of the global need for more, and more affordable, just-in-time, location-agnostic learning. We all need to keep pace with the ever-faster rate of change and the ever-increasing level of competition in the world around us. I would suggest that MOOCs should be viewed as simply another optional component of a blended learning solution. Already, the job description for “college professor” in many cases is evolving to include teaching at least some content online, if not in a MOOC, then in a private online course. MOOCs are still finding their audience, and learning how to deliver their product for maximal impact. MOOCs are also still finding their price point. After all, some MOOC creators are for-profit organizations. If the purveyors of MOOCs become too greedy, MOOC use will quickly become self-limiting. But if the one course I’ve taken so far is any indication, the audience is out there all over the world, and the potential learning benefit is enormous. Like any other form of education, ultimately, you get out of it what you put into it. As Hamlet says: “There is nothing either good or bad, but thinking makes it so.” I think MOOCs are both inevitable, and full of potential. It’s up to us to shape that potential and make it what we need it to be. 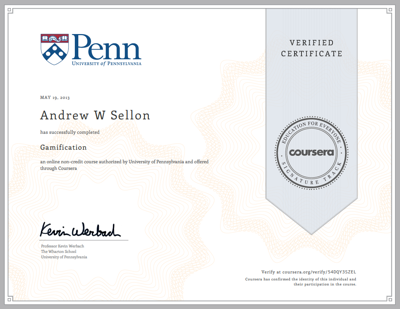 The Gamification course I took was with Professor Kevin Werbach from The Wharton School at UPenn via Coursera, and while Coursera (unlike Harvard’s EdX) is for-profit, the course I took was free. Professor Werbach will be offering it again on Coursera this fall; I heartily recommend it to anyone in any business. The author of the slate.com article needs to step back, calm down, and find his new place in the current, tech-inclusive bigger picture of education. Because MOOCs represent an opportunity to learn for both students and professors. If you want to read more on this topic, I encourage you to check out this recent lengthy article from the New Yorker magazine.